The United States’ prosecution of Asian gambling whale Paul Phua continues to run aground, with recent days’ events including a key second batch of evidence ruled inadmissible by the case’s presiding judge. 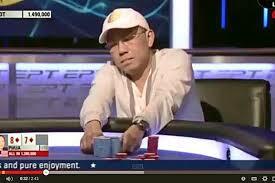 Paul Phua, in one of his several televised-poker appearances. The case centers around Phua (full name Wei Seng Phua) and his involvement and/or operation of an illegal online gambling operation run in clandestine fashion last summer from guest villas at Caesars Palace in Las Vegas. Federal prosecutors have alleged that Phua himself was the kingpin of the operation, having moved it there after Phua and nearly two dozen others were arrested in Macau in May of 2014 on similar illegal-gambling charges. Six other defendants in the case, including Phua’s son Wai Kit (Darren), have already accepted plea deals, paid hefty fines, and departed the US for their homes in Asian Pacific countries. The case against an eighth original defendant was dismissed. Paul Phua is the final defendant in the case, and in the eyes of the FBI and USAO prosecutors, the most important of them all. However, the case against Phua was the most tenuous of all those brought when indictments were handed down last year. The Phuas, father and son, occupied one of three of the luxurious guest villas at Caesars Palace. Other associates of Phua, including several other Asian gambling whales, occupied the other two villas, including the one where the true “boiler room” online-bookmaking operation was being run. Authorities have alleged that the group processed more than $300 million in wagers over several weeks from late May to early July while operating from the Caesars Palace hookup. The action was largely on matchups in last summer’s FIFA World Cup. Tying the boiler-room betting operation was always the goal of prosecutors and federal agents, as has subsequently been revealed in a series of depositions given by government witnesses. However, the means by which the FBI and the USAO (United States Attorney’s Office, here for the District of Nevada) assembled that evidence resulted in said evidence being tossed. Among the charades designed to obtain evidence against Phua: a complicated ruse in which FBI agents turned off high-speed Internet access to Phua’s villa, then posed as repairmen pretending to “fix” the outage. At least one FBI agent has also been exposed as intentionally misstating the nature of other evidence when seeking an initial search warrant in the case. Several weeks ago, US District Judge Andrew Gordon tossed out all evidence obtained from Phua’s Villa 8888 at Caesars Palace, ruling that the repairman ruse violated Phua’s Fourth Amendment rights, which apply to all people within the US, citizens or not. Last week, following weeks of heated arguments from both the prosecution and defense, Judge Gordon tossed out all evidence seized from the other two villas, ruling it inadmissible as fruit of the poisoned tree — the warrantless “repairman” ruse and the falsely-obtained search warrant together. The twin tossings of evidence leaves very little the US government can use against Phua. Even such scant evidence as a text message other scraped from Phua’s laptop from an associate reading, “Good luck with the hedge bet,” can no longer be used. Phua’s powerful defense team, featuring high-profile Las Vegas and Maryland attorneys David Z. Chesnoff, Richard Schonfeld and Thomas Goldstein, have wasted no time in pressing their advantage. Weeks ago, the defense attorneys sought an easing in travel restrictions on Phua, so he could return to Malaysia to visit his ailing mother. Phua currently remains free on $2.5 million bail but confined to the Las Vegas / Clark County area. The jet has long appeared to be the prize plum in the case, that valuable bauble that prosecutors perhaps would like to see forfeited in exchange for a possible plea deal in the case. However, Phua’s expensive — and high-priced — defense has made the forfeiture of that jet a less-than-likely outcome. Q I see. So you had the discussion with [prosecutor] on July 1st about whether there was sufficient probable cause to go into the Villas? A Not to details because he said I should talk to [second prosecutor] about it. Q Well, I thought you agreed you have to tighten it up. A Yes. His information to me was he would prosecute the case or assign an assistant U.S. attorney to prosecute the case and the jet is seizable if we have the evidence. Q I see. Oh, so this probable cause is about seizing the jet? A We’re talking about two different things. The prosecution’s reeling in the case comes despite the recent filing of an additional conspiracy charge against Phua. That charge was added to a pair of illegal-gambling-operation counts, likely in the expectation that at least some evidence seized from the Caesars Palace villas would eventually be admitted into the case. However, Judge Gordon’s most recent ruling makes the conspiracy case as questionable — viewed from the likelihood of a successful prosecution — as the other counts. Phua’s defense believes that the US government prosecutors will now seek a continuance in the case, which could push any trial date into late 2016. That’s another reason why they’ve asked Judge Gordon both to remove Phua’s travel restrictions and release his private jet. The original trial date in the case has already been pushed back several times, the latest delay moving its start from June 1st (tomorrow) to June 15th. The June 15th date is now unlikely as well.